It's WiiWare week for Europe again, and this time there are once again two new games available. Although you might as well say it's just one, as one of them was already released in the US and was found to be rather shockingly bad. The "new" game of the bunch is Pirates: The Key of Dreams, in which you can play as a pirate, sailing the seas, recruiting new men, battling other ships, finding treasure and talking to people in towns, all leading to the ultimate goal: Finding the "Key of Dreams". 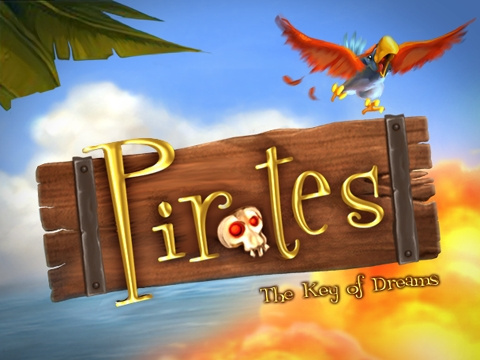 The game is a prequel to the now released DS game Pirates: Duels on the High Seas. Obviously we don't have a review already, but if you want to find out some more about the game, you could read the interview we had with the game's developer, Oxygen Games. The game costs 1000 Wii Points. If in doubt just wait for our review which will be coming soon. Today's other game was released in the USA the week before last and is already somewhat notorious. SPOGS Racing makes you play as "SPOGS Racers", basically wheels with a pog inside (You know them, those things you could get in potato chip bags in the 90's!) as you race through extremely bland landscapes to place first. There's also an interesting mechanic where you can steal parts of other Racers. However, we already reviewed the game when it was released in the US, and it was (And obviously, still is) the lowest rated WiiWare game currently released. Download with extreme caution! This game also costs 1000 Wii Points. That's all today! Next week is most likely Virtual Console week in Europe again, so you'll have to wait for the week after! Note: Australia and New Zealand didn't get SPOGS Racing today for some reason. Consider yourself lucky! We had to get SPOGS Sometime . As for Pirates, i was expecting this and all i can say is this. Yay! Excited to see what Pirates is like. Also, when did we give you permission to get a WiiWare game the US didnt get before huh?? Ill have to talk with the King of America about this! Pretty good release, Not going to bother with Spogs but Pirates is right up there with Toki Tori in my book. Excellent game and well worth the 1000 points, Multiplayer is awesome, comparible to bomberman as it's similar style. Pirates is good, I like it. However, be warned that all three control methods are a bit strange, and the game runs in 4:3. It does only use 125 blocks though, which is very impressive. huh. i heard australia was getting Defend Your Castle today. Must have been an incorrect report or else nobody here has checked the Australian Wii Shop. Odd thing is that the Nintendo Channel shows that Defend Your Castle is available for 500 points, yets we have Spogs and Pirates. Not that I mind though, ive been waiting for Pirates for ages. Just downloaded it and spent a good 45 mins on it and loved it. Reminds me of an arcade version of the Pirates of the Spannish Main / Pirates of the Caribbean Collectible Model Game by Wizz Kids except without having to build up the tiny models and having to find someone to play against. Good Fun though, cant wait to try multiplayer tommorow. and see what you think. Are there any more games Nintendo had on that initial release list left? DEMON has done a First Look Video of Pirates If anyone wants to check it out. Just uploading it now so it should be up in around 30 minutes or so. Will this mean Pirates for NA on Monday? Only time will tell. I believe Pirates, Platcchen, and Strong Bad are the greatest candidates for Monday now. PLEASE STRONG BAD ON MONDAY! PLEEEAAASE!!! This sounds like a fun game. I should see Demon's video to get a better look at it. Thanks Demon! I've been interested in Pirates ever since reading the game description. Looks ace. Let's hope we get this on Monday. And yeah, let's just pretend we only got one game this week. Guess what WiiWare game the U.S. is getting on monday? I hope we get Pirates, since early opinions seem relatively good. As for a second game, I hope they release SPOGS again. It deserves another review too, lets face it, Corbie just couldn't appreciate the quirky gameplay and classic visuals. man, you got a good one. before America too. i hope we get pirates this monday, or plattchen. notice how i didn't even mention SPOGS? i am trying to delete it from my mind. Strade, my brother was desperately trying to get me to buy it *shudders*. @supermario You sound almost serious!?!?! And yes, Pirates looks pretty good. Let's hope for this, and Strongbad (assuming it also costs 1000, so i can get both) this week. But I've also been hearing PLATTCHEN a lot. And some decent VC wouldnt hurt either...Anyway, not bad update Europe. Not great, but not bad. I originally thought Pirates looked boring but Demon212's first look made me change my mind I almost risked SPOGS Racing. Pirates is brilliant and I think that everyone will be glotting that we got it way before the Americans this is a great day to be european. I first thought that this Pirates has something to do with the strategy-game "Pirates!" that was originally released around 1987 for the C64 and Amiga (and CPC, Mac, NES, PC, Atari ST, Apple 2). But it does not seem so. This Wiiware is more like what? A shooter with a bit of strategy? @x.SuperMario.x: I hope you're sarcastic, because you say to nearly every decent game that had been uploaded in the past 'fu Nintendo' and such, but then you defend SPOGS? Has anyone tested yet if DYC is available in Australia? It appears that SPOGS wasn't released here in Australia today- only pirates. @ sadpanda212, I think I remember having Overboard on a Demo disk for the PS1, yeah it is very similar to what I remember. @Homer: So, no Defend your Catsle in Australia? it really don't get some delays ... I don't think there is more than 2 pages of text total in that game so no saying it's because of languages !!! Wasn't there a new Sid Meier's Pirates not that long ago for the PC? I think it came out in 2004 or something along those lines. Yeah, Sid's Pirates! was remade back in 2004 in nice 3D graphics and I am told it is true to the original. It ended up coming to PC, XBox and PSP at different points. I have the PC one. ... but where is my Gyrostarr, Nintendo Europe!? I´ll stay far away from SPOGS. Pirates don´t interest me much either. Doubt I´ll get any Wii Ware at all before Mega Man 9. Anyway, now this week is over and I can look forward to some VC games next friday. Lol, Australia really didn't get SPOGS! But have no fears, Australian comrades, I guess you escaped a bullet there! Maybe Nintendo Australia decided to spare us from the awfulness of SPOGS? I'm certainly not complaining. And Marcel, perhaps you could add a note to the end of the article saying that OZ only got Pirates? I think the reason might be juristical, like it was with Axelay, we still haven't got it in Europe! Don't you have to add them afterwards because they will get lost, or can't you add European Wii Points and in Australia and viceversa? And do Wii Points get lost everytime you switch continents? Changing between USA and Brasil is OK to do without penalty. However on the PAL console switching betwen Australia to a Euro country will wipe out your Wii points. If you do this I would advise spending your points first. Switching regions and adding 2000 points. Buy what you wanted and something extra to spend ALL the points. Then switch back to Australia region. So you can switch to Australia and upload European points after the switch to buy something (and viceversa)? And can you use Points cards you got from NoEs Shop (1000, 500, 300, 100)? I haven't a clue how to buy AU points, so I just done the smart thing, bought the Axelay cart, lol. Hmm well two games and one is horrible. Wonder how the Pirates game is. @ChocoDK Pirates is alright could of been better in the campaign and multiplayer but other than that it's fine.